Constructed of all archival paper and materials! This album is a top notch quality binder, hand stitched and loaded with intricate details for holding 3 all ring notebook pages, including Hagner stocksheets and Supersafe pages. This matching slip case goes with the (DB) deluxe archival collection binder. This hand made sllip case is made with all archival paper and paperboard materials. 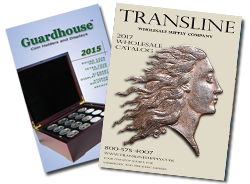 The standard Supersafe binder is a value with an MSRP of only 14.50. These binders have vinyl cover and work with all coin note book pages. This binder is also designed to hold Hagner stocksheets. Available in Blue, Black, Red and Brown. The standard Supersafe binder is a value with an MSRP of only 14.50. These binders have vinyl cover and work with all coin note book pages. This binder is also designed to hold Hagner stocksheets. Available in Blue, Black, Red and Gray.